This morning I am presenting at Multifamily NW’s Fall 2016 Apartment Report event. While the report itself shows some progress being made in terms of bringing more balance to the housing market (increased construction and rising vacancy rates), I wanted to share my portion which does pertain to the Portland metro economy. I will follow-up next week with some additional thoughts on other regions of the state. Statewide, household incomes are rising for those in the middle and lower parts of the distribution. 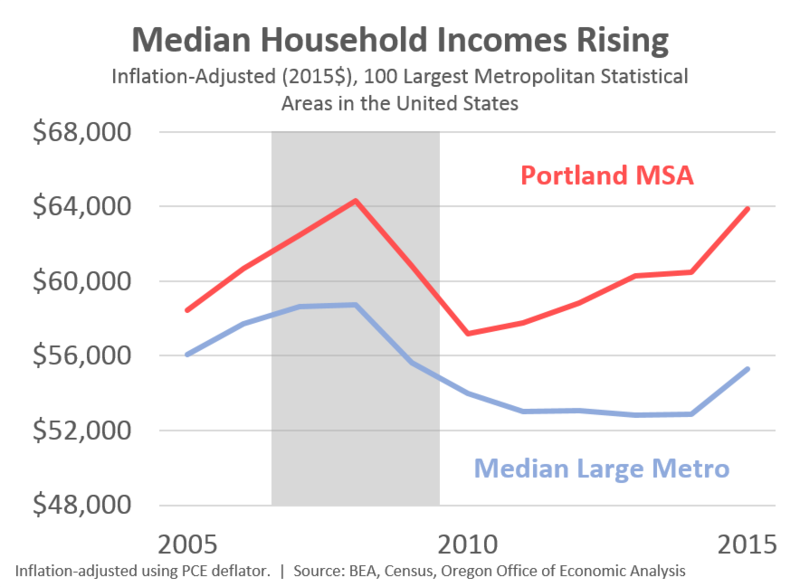 Like the state overall, median household income in Portland is one percent below its previous peak after taking into account inflation. Incomes in the typical large metro across the nation, however, remain some six percent below. 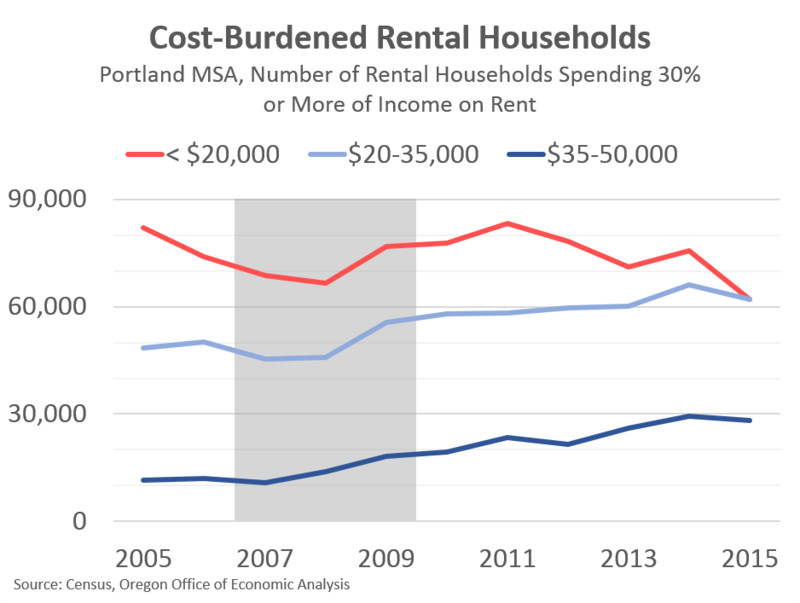 Overall, Portland median household income is now more than 15 percent ($8,500) above the typical large metro’s income. These improvements are due to the tightening labor market. Given that wages and the safety net make up the majority of income for such households, the strong labor market and wage gains are pulling workers and families out of poverty today. The business cycle is not dead. These improvements are seen among households in deep poverty, those with incomes less than half the official poverty level. Furthermore, poverty has improved proportionately for both whites and people of color alike. There is still a large racial gap locally and nationally. However that gap is not widening, which is better than the alternative. 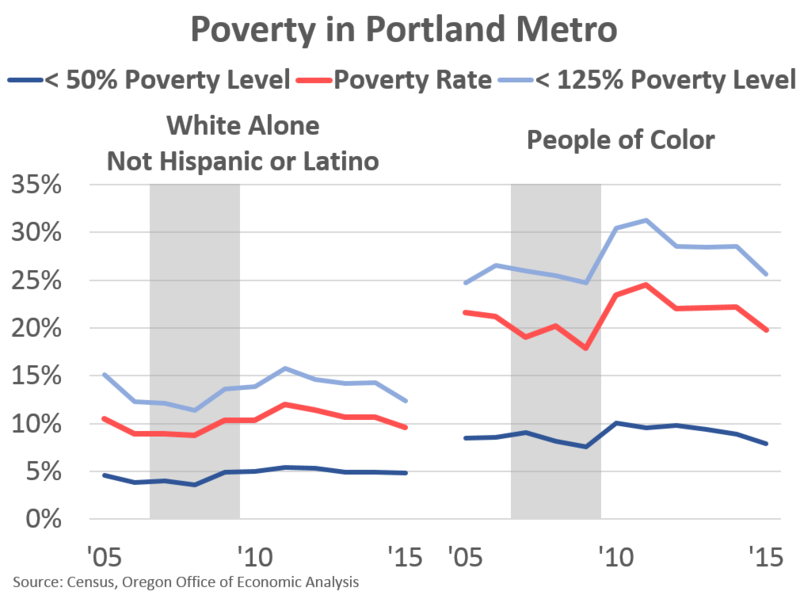 All told, the various poverty rates in the Portland region are now about three-fourths, or 75% recovered relative to pre-Great Recession rates. Finally there is some good news in terms of the low-income, cost-burdened households, although it is certainly more of a mixed bag. The number of such households in the $30,000 or $40,000 range continue to be larger, even as the number making less than $20,000 is declining. Some of this is due to more jobs and rising wages, which is obviously good. However some of this improvement is likely due to inflation and some is likely due to displacement. And this is metro level displacement, where households move out of the region entirely. It is likely that all three factors are at play here, however it will require a lot more data work to try and figure out which factor is largest. All told, the tightening labor market is beginning to create improvements in some of these deeper measures of economic well-being. As stated the other day, progress made in terms of poverty rates and needs-based caseloads depends, at least in part, on how long the economy remains strong. Stay tuned for a broader statewide look at this next week.